If the sweeping economic reforms planned by Chinese leaders during the Third Plenum can be our guide, it looks to be a promising decade for global investors. Details released recently confirmed President Xi Jinping’s concerted efforts to move China toward a market-based economy that mirrors the West. The plan’s comprehensive nature and the level of clarity evidently pleased investors, as many Chinese stocks experienced a pop. We believe the positive effect on the equity markets will not be short-lived or limited. A component of U.S. Global’s investment process is to closely follow government policies because they tend to be precursors to change. Xi’s policies, if successfully implemented, “will undoubtedly have profound long-term implications for the Chinese economy and society at large,” spanning economic, political, cultural, social and environmental issues, says BCA. Some say the sweeping reforms will have an impact similar to the momentous changes following the Third Plenary Session in 1978, when Deng Xiaoping instilled the concept of free markets and ushered in a new economic era. “Covering 15 major areas and 60 key points, the document is specific, substantial, comprehensive and actionable,” says Jefferies. The changes are so significant, it “rivals that of 1978, when Deng Xiaoping declared the opening of China,” says the research firm. I asked Michael Ding, CFA, portfolio manager of the China Region Fund, to share his thoughts regarding these sweeping changes and the potential effects on the markets. He has fascinating insight on this subject, as Michael grew up in rural Dalian and is of the same generation as the nation’s leaders. This age group was raised in the era of severe government controls, such as food rations; still fresh in their leaders’ minds was the stagnation of the country. Improving market inefficiencies is one significant and positive effect, says Michael. Currently, government interventions prevent companies from setting competitive prices. Releasing control should allow the market to decide what prices should be and where labor and capital should be allocated. BCA says that three areas likely to see improvements in pricing mechanisms include money, resources and land. Changing the pricing mechanism of money influences the exchange rate and interest rates. The research firm says that “the proposed reforms involve freer cross-border capital flows, improved convertibility of the RMB and eventually a market-driven floating exchange rate system.” In addition, more liberal interest rates should allow markets to price capital based on risk and supply and demand, says BCA. When it comes to resources, the government plans to reduce subsidies and “administrative meddling” in several sectors, including water, petroleum, natural gas, electricity, transportation and telecommunications, which should allow for more competition, according to BCA. The reforms affecting the pricing mechanism of land will likely allow for the equal treatment of rural and urban lands. Whereas the government formerly seized rural land, people who live in rural areas in the future could “monetize the rising value of rural residential land” and ease supply shortages in major cities, says BCA. Included in the considerable social changes are relaxing the one-child policy and reforming the hukou system, which is China’s residency status system. Now, couples will be allowed to have two children if one parent is an only child. This change wasn’t a surprise to us, as it follows the rise we’ve seen in birth rates in recent years. As you can see below, the number of annual births in China has been increasing since 2011. In many cases, with rising incomes, couples can afford to pay the required fine. Changing the one-child policy could be the beginning of a rising demographic cycle in China, which bodes well for a wide range of companies. The country may see an increase in demand for residential housing and social housing, income protection products, and child-targeted products, such as infant formula. The change may also boost demand for larger vehicles, such as sport-utility vehicles, and Internet companies could benefit from increased users in the years ahead, according to Citi Research. Demand on resources will be great, as each person requires a huge supply of resources throughout his or her lifetime. 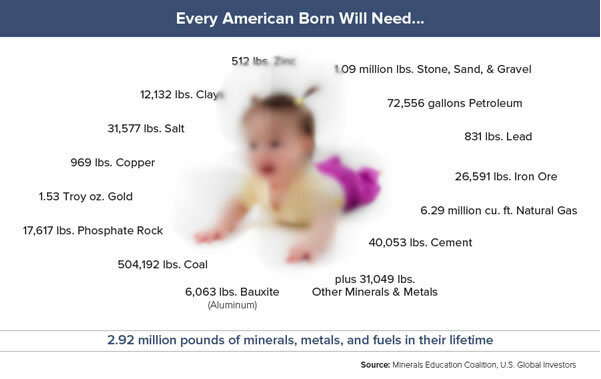 Consider that in the U.S., over the course of a lifetime, each person needs 72,556 gallons of petroleum, 6.63 million cubic feet of natural gas, 978 pounds of copper, and 27,416 pounds of iron ore, according to the Minerals Education Coalition. Even though China currently uses fewer resources per capita compared to developed countries, the nation is quickly catching up to developed world levels. The decision to reform the hukou is also equally important for resource investors. The plan will gradually allow rural migrants to become official city residents. While it may be expensive, “the Party has no choice but to provide migrant workers and their families with equal access to education, health care and other urban social services,” writes Andy Rothman from CLSA. With more workers living in cities, property sales in China’s 600 third-tier cities could significantly benefit from hukou reform, as about 100 million migrant workers currently reside in these cities. Americans recently reflected on the 50th Anniversary of the assassination of John F. Kennedy. His death was devastating, as it essentially ended the Camelot reign full of potential and promise for the country’s future. Today, Chinese President Xi Jinping and First Lady Peng Liyuan are ushering in a Camelot era for China. Similar to the Kennedys, the couple symbolizes the economic and ever-advancing strength of the country. Xi, a princeling, is the son of Xi Zhongxun, who was among the first generation of Chinese leadership. His father’s claim to fame was in creating a special economic zone in Shenzhen, transforming the area from a small village to one of the fastest-growing cities in the world and one of the busiest container ports in China. First Lady Peng is very familiar with the limelight, as she was once more famous than her husband, singing patriotic songs in the People’s Liberation Army. Peng is very different from previous Chinese first ladies, who were typically invisible to the rest of the world. As the rest of the world gets to know her, the first lady will likely broaden the appeal of China. Want to receive more commentaries like this one? Sign up to receive email updates from Frank Holmes and the rest of the U.S. Global Investors team, follow us on Twitter or like us on Facebook. U.S. Global Investors, Inc. is an investment management firm specializing in gold, natural resources, emerging markets and global infrastructure opportunities around the world. The company, headquartered in San Antonio, Texas, manages 13 no-load mutual funds in the U.S. Global Investors fund family, as well as funds for international clients. All opinions expressed and data provided are subject to change without notice. Some of these opinions may not be appropriate to every investor.Standard deviation is a measure of the dispersion of a set of data from its mean. The more spread apart the data, the higher the deviation. Standard deviation is also known as historical volatility. All opinions expressed and data provided are subject to change without notice. Some of these opinions may not be appropriate to every investor. The S&P 500 Stock Index is a widely recognized capitalization-weighted index of 500 common stock prices in U.S. companies. The NYSE Arca Gold BUGS (Basket of Unhedged Gold Stocks) Index (HUI) is a modified equal dollar weighted index of companies involved in gold mining. The HUI Index was designed to provide significant exposure to near term movements in gold prices by including companies that do not hedge their gold production beyond 1.5 years. The MSCI Emerging Markets Index is a free float-adjusted market capitalization index that is designed to measure equity market performance in the global emerging markets. The U.S. Trade Weighted Dollar Index provides a general indication of the international value of the U.S. dollar.